Lots of questions come up concerning various “oil” and poly finishing mixtures and methods. Some of the “oil” products: Watco danish oil, deft danish oil, Minwax tung oil (actually urethane wiping varnish), Minwax Antique oil, actual tung oil. Below are links to two articles by Bob Flexner that provide a great deal of information on the subject. The first is from 2008, the second from 2011. The short and sweet version is plain old varnish, poly/alkyd/phenolic (poly is about all that can be found these days) thinned ~1:1 with mineral spirits actually works as good or better than all these other magic potions because it dries hard, not soft. As Bob says, there are different “levels” that can be achieved with a wiping varnish determined by the amount left on the surface: wipe off completely, leave a thicker film, or anywhere in between. 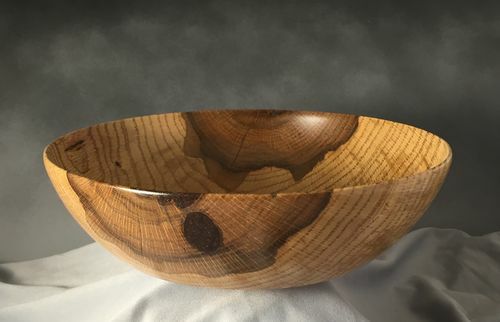 Given 5-10 minutes or so to fully soak into the wood, kept wet, and then wiped off almost dry, wiping varnish will have the same look as BLO, but because it dries hard, provides some protection to the wood. The only thing mixing BLO with varnish accomplishes is to making a softer, less durable, slower drying finish. The same is true for the danish oils and various tung oils. Having tested all of them, I can’t come up with any reason to use them vs varnish, regardless of the desired final look. Many claim the oils are more easily repaired. I’ve never had an issue lightly wet sanding an existing thin film poly finish with thinned poly, wiping it off, and I’m done – the same process one would do with these oil finishes. For raw wood, apply 2 coats. Keep the surface wet for 5-10min then wipe off. Leave the sanding dust from the final finish sanding. It will be wiped into the negative grain to help fill some. This will completely seal the surface. This may be all that is desired. 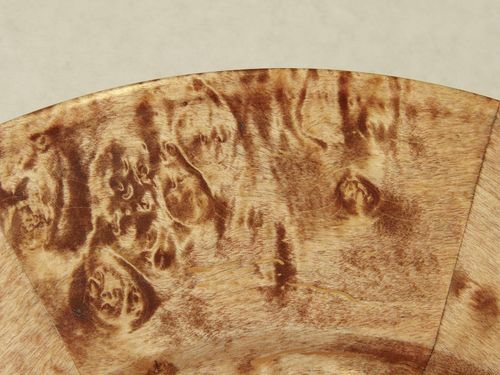 For blotch prone wood (pine, cherry, birch and others) you may want to condition the wood before topcoating, explained here, especially if you add color as covered below. After 2-3 coats I like to wet sand with the thinned poly to really smooth the surface. For thicker film finishes, add wipe on coats or brushed coats as desired. For brushing, the 1:1 can be used, or thicker viscosity. Finishing the finish will need to be done after the additional coats. I’ve found quartering the blue shop towels and folding into a “brush” makes a good applicator, as do old t-shirts etc. If you find the surface too sticky to wipe off, simply add some wiping varnish mix to the surface. This will thin it and allow it to be wiped off. Many people will mention using dewaxed shellac to seal the wood. As explained in the blotch control blog, shellac is not a good choice due to its short open time. I use shellac a lot but not to seal for blotch control. For non-poly oil based varnish, there are only 2 products still available that I know of, Pratt & Lambert 38 and Sherwin-Williams Fast Dry Varnish. For thin wipe-on finishes I can’t tell the difference between these and a poly. I notice some improved clarity for thick film finishes, but only gloss sheens. For semi-gloss and satin, I don’t detect a difference, and the non poly varnishes are a bit softer. I think poly gets a lot of bad raps because people slap on several thick heavy coats and complain it looks cloudy and/or like plastic. I prefer to use Minwax poly, and usually semigloss. Semigloss or satin keeps the negative grain and other areas of the project that are inaccessible from being glossy and plastic looking. Many state they prefer General Finishes Arm-R-Seal. It’s a good finish, but it is a poly just like the MW product. The biggest difference is Arm R Seal is thinned to be a wiping varnish. It has ~ 1/2 the solids content of MW poly (not the wiping varnish). ARS sells for ~$22/qt. I can buy MW poly and mineral spirits and do the extremely difficult task of mixing 1:1 poly and mineral spirits and have the same thing for ~$10/qt. MW poly is also much more readily available for me. ARS will not need to be thinned. One thing Bob doesn’t discuss is color. Some of the different finishes have more color to them, and impart more color to the wood, which many people like (me included). In the picture below are the following 3 finishes in order left to right: Minwax Poly, BLO, Deft Danish Oil. Below are each of these applied to soft maple. A heavy black line separates each one. Each was applied for ~ 5 minutes, continually keeping the surface wet, then wiped off “dry”. The poly and BLO were thinned 1:1 with MS, the Deft was not. There isn’t much difference between the poly and BLO, but more difference may occur with more coats. The Danish Oil is noticeably darker, just as it is in the plastic cup above, though notice to a lesser degree when applied to the wood. 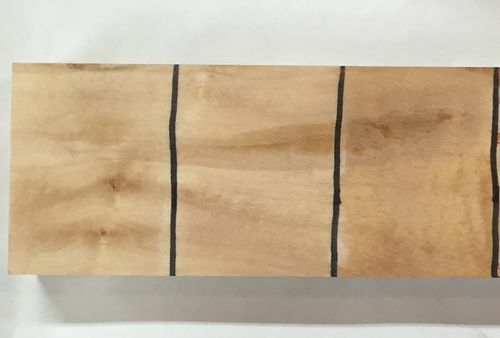 Below is a picture of the same piece of wood, but now showing a reddish-orange color at the far right. 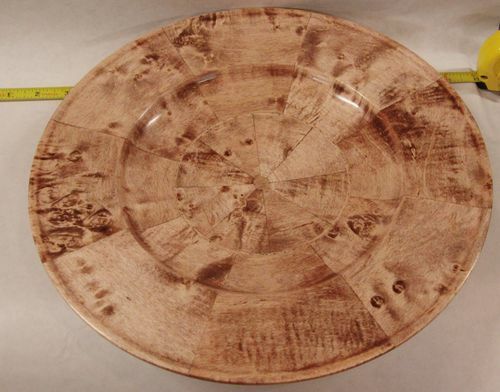 This was created using Minwax poly thinned 1:1 with MS, with W.D. Lockwood oil soluble dye added. This mix was applied the same as the others. As you can see, quite a bit of color can be added this way – this is just one application. You may not like the color, but this was some mixture I had left over from a project. Just about any color to varying intensities can be created this way. 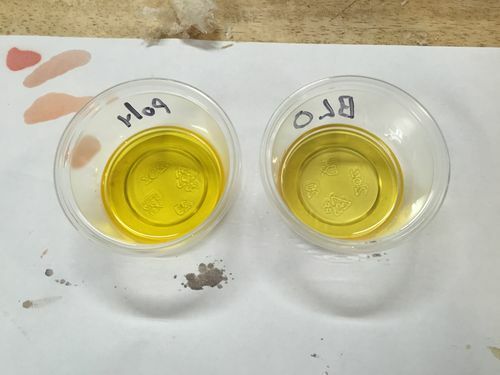 Below is a picture of poly with yellow dye added on the left next to BLO on the right. Pretty close match. All of your wipe on finishing requirements could be addressed using the same base finish, an oil based varnish, poly/alkyd/phenolic. Varying the amount of thinner will vary the application and end result, and coupled with how much is wiped off, the finished film thickness. Varnish can be purchased in different glosses, or gloss can be rubbed down in gloss with steel wool or synthetic steel wool. Oil soluble dyes, or the dye (liquid portion after settling) of oil based stains can be used to tint the varnish to the desired level. If a lot of color is desired, just add a little poly varnish to the dye to act as a binder – otherwise varnish topcoats will lift and mix the dye reducing intensity. I like it because I can sand a surface to smooth it out or fill the grain and not have to be concerned with sanding through the film – the tinted varnish will just blend it right in, no different than all of the store bought finishes that have more color to them. Depending on the project, sometimes I will do a coat or two of highly thinned varnish with dye to get the color and surface I want by sanding or steel wool, then use just thinned varnish without added color to build a film. Dry or wet sanding works. There are many varied approaches in using wiping varnish and a little color. For the initial application. there’s no need to remove the sanding dust. It will be wiped into the negative grain and any remaining dust will be wiped off with the final wipe of the 1st coat. This will enhance negative grain. If you want less negative grain visibility, then wipe off all the dust before application. 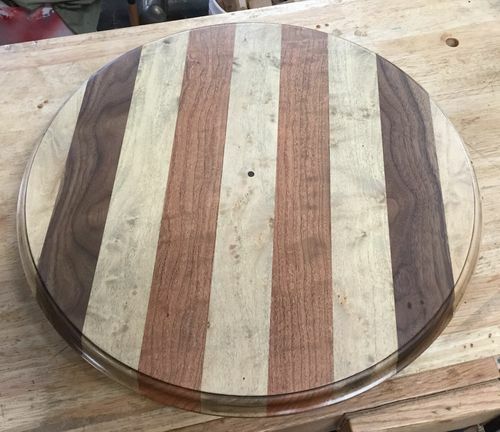 Pictured below is a 14” lazy susan table, made with maple, cherry, and walnut, finished in the described manner. A little bit of the dye portion from Minwax Dark Walnut stain was added to the thinned poly to enhance the grain. Because of the cherry and maple, the completedpoiece was conditioned to control blotching prior to applying the poly. 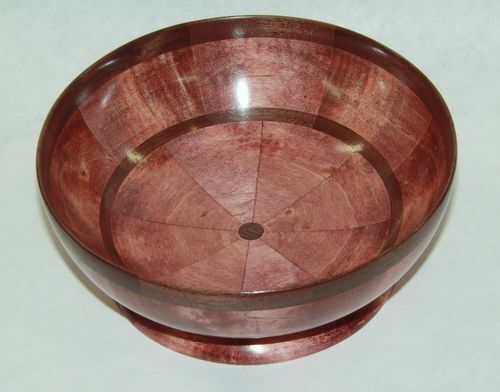 Here is a 6” maple and walnut bowl finished with a bit of dye to give it a pinkish hue. There are two big advantages to this approach: 1) cost, 2) about any color can be achieved. A quart of Minwax poly is ~$11-$12, which can make 2+ quarts of wiping varnish when thinned. A gallon of MS is ~$14. The Lockwood dyes are ~$7.50-$12.50 per ounce package, that will make ~ 8 oz of intense dye (I use naptha and store in glass canning jars to prevent evaporation). That 8 ox of dye will last a long time. I get the little 2 oz plastic cups with lids at Walmart and mix up the wiping varnish in them for small projects. A set of stainless kitchen measuring spoons handle all of the measuring activities. 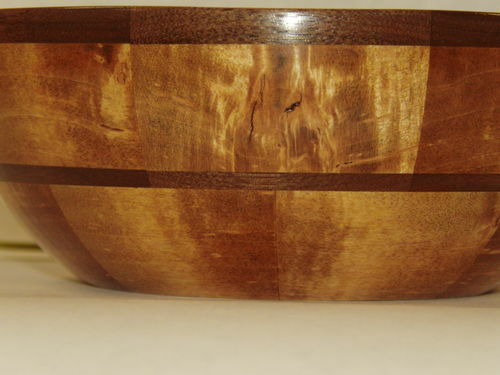 A lot of the bowls I have posted in my projects were finished this way. More examples below. OSU, another very helpful article. Thank you! When looked at title of your blog thought were going to discuss oil varnish mixing. BLO or oil has no part in wiping varnish/poly. Although chemically different Poly & Varnish essentially resins + other chemicals cannot spell, pronounce, or figure out what they do. Poly & varnishes are film building finishes. Oil Varnish Blends (OVB), you do use oil, resin, & solvent. With OVB will not get a build-up of finish with more coats. You do retain matt/satin sheen or natural wood look. Homebrew mix simply equal amounts of BLO, resin, solvent (1/3,1/3,1/3 formula found in the web). Wiping Varnish simply resin & solvent and with 50-50 mix 2 coats should equal one coat of film finish. If buying a wipe on product read label contents to ensure product does not contain more that 60% Solvent. Both oil varnish blends & wiping varnish/poly have their place depending upon use & personal preferences. Making your own can save you some money because can mix only what you need when you need it. Tung oil is made from seeds within the nut, so no worries about nut allergies. Pure Tung Oil is making a comeback because food safe & low or no VOC’s. If use pure & no solvents food safe, at solvent you have no or low VOC’s. Most commercial wood finishing products Flexner mentions is article labeled Tung Oil use less expensive non-drying or semi drying oils if contain any oil at all. None of the drying oils (Linseed, Tung, and Walnut) penetrate wood very deeply without solvent. Adding solvent speeds up drying time and increases oil penetration. While don’t recommend using linseed oil do think both Tung & Walnut oils have a place for finishing some woodturnings. Could explain why’s and why not but think have said enough. 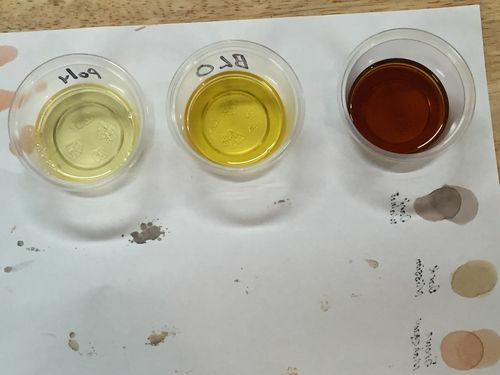 Not sure, but I think you missed the whole point of this blog entry – it’s my opinion that all of the “drying oils” are a waste of time and $ – I agree with Flexner. The same look and superior protection can be achieved with a thinned varnish – it’s all about how the product is applied. Appears you also missed Flexner’s point – most of the wiping oils and finishes really are thinned varnish or a varnish/oil mix. I’ve done the testing and comparisons of tung, walnut, and many of the “potions” available commercially and diy, “flat” wood and turnings, which is how I arrived at my opinion and recommendation. BTW, all of them are food safe when cured. Have a good feel for where Flexner is coming from explaining manufacturers catering to people looking for easy wood finishes and how can make your own and save money. Have been using his book “Understanding Wood Finishing, since 1994. He is not the only professional wood finisher saying the same things. If bought one of his books or others would find lots of information on adding color to wood. My disagreement is way you presented your information! Have no problem with Flexner telling us Tung oil is made from nuts when it’s the seed within the nuts used! He says same thing in his book but also tells you Tung oil is water proof or water resistant. The number of coats required to achieve any level of protection is kind of arbitrary. Unlike you think do not think there is one finishing material for every application. Definitely disagree with you & Flexner have to say about food safe finishes! 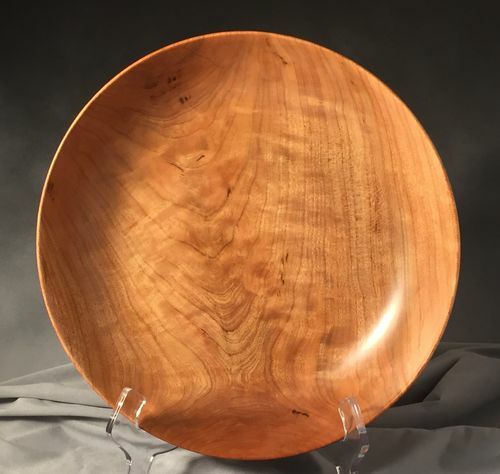 Food Safe Finishes, summary of non toxic finishing products ideas for cutting boards, salad bowls, and other food centric woodwork. I can agree to disagree. Curious what you disagree with as far as the presentation? This entry concerns only thin, wipe on/off finishing. For that app, if you think the other oils and potions have a use (maybe they do for outdoor, but thats a whole different discussion), ok, and I dont. My objective is to help simplify all of the mktg and mythology that exists and provide the less experienced a way to achieve equal and even better results with simple, cost effective methods. All of the different products arent needed, much less required. Also curious if you have tried the methods described, and what you found makes tung, walnut, or BLO necessary (other than smell or voc’s) vs poly? Please provide details of the tests and results – you may have observed behavior/results I didnt get. Im always searching for new factual information. Great post. Using just straight thinned poly seems like heresy, but I agree, the results speak for themselves. It’s funny that most of us have been conditioned to see poly only as a topcoat.